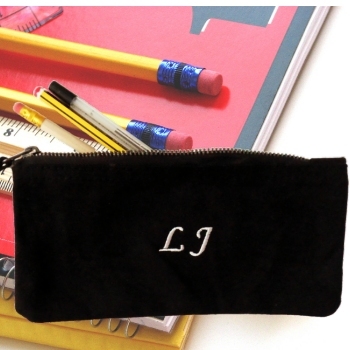 Personalised cotton pencil case embroidered with a name or initials of your choice. Personalised cotton pencil case embroidered with a name or initials of your choice. Sturdy Black canvas pencil and pens case. Personalised with Embroidery so it won't rub off! Personalised cotton pencil case embroidered with a name or initials of your choice. Sturdy Black canvas pencil and pens case. Personalised with Embroidery so it won't rub off! Use as a school pencil case, cosmetics case or little arts and crafts case, ideal for back to school! This solid black canvas case is made from sturdy cotton and has a robust metal zip along the top. Case measures 20 x 11cm.